Count to 100, easy peasy. But what do our children actually know and understand about these numbers? To start off our learning in maths in P4 (yes, I teach p4 now), we’ve been having a play about with different ways of visualising numbers. We started with the quantity model of number, which I find it hard to define, but basically means looking at number in terms of how many we’ve got. We started with using these amazing string of beads, which are cleverly divided into 10 groups of 10. The bigger the number, the more beads you have. Seems obvious, but it is a good building block on the way to understanding numberlines. 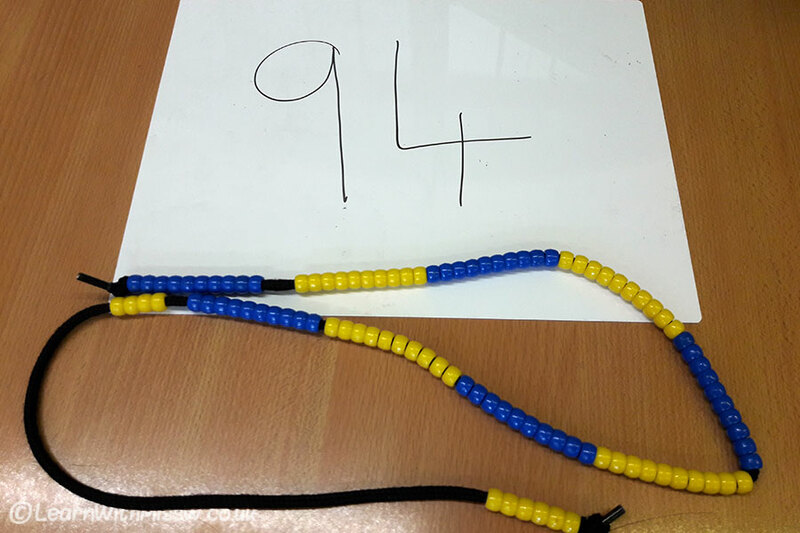 See what interesting things your children do if you ask them to make a number bigger than 100 on their bead string! Lots of interesting demonstrations of the children’s understanding of number, e.g. counting on in whole tens. As the children knew they had 100 beads, some were able to juggle their number facts to find short cuts. Rather than counting 9 whole tens and 4 more for 94, they simply took 6 away from their hundred. My kids had access to a whiteboard while we were experimenting with the bead strings, which gave us even more possibilities.